i’m with you. I’d knock ’em down. I would kill anyone off those with a bow. TO CA. MABE ONE REASON YOU DONT SEE RACKS LIKE THAT TO OFTEN IN CALI. 28MILL. PEOPLE DOING THE SOME. TO DON , NICE PICS KEEP IT UP! These three blacktails are all quality. Especially the one on the right. Nice to see there are still great blackies for the taking. I can’t believe yall would not let these guys walk. That is why there are not many big bucks, because people like you shoot the young small bucks and never let them mature and get bigger. I would have to agree with the guys that say let them walk. Nice pic though. 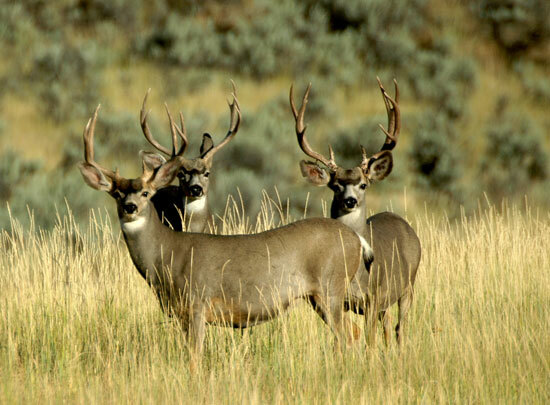 the buck on the right might be a shooter but i think i would let em walk. good thing theres guys on here like Trophy Hunter that know what the heck their talkin about! The one on the right is a shooter. He’s not gonna grow much wider than he is. The other two have some time to grow however.